One of my favorite Jim Carrey Movies is Ace Ventura Pet Detective and my favorite scene from the Movie is when he goes “cleverly disguised” as a mental patient who thinks he is a Football Player. Jim Carrey is one of the best comedians ever. I thought of the costume idea when I was invited to a Halloween party, and of course everyone would be dressed as the usual, some superhero, a “scary” zombie, and pretty much naked outfits. I wanted to be the wierd guy that gets invited to parties and be something nobody else would think. I watched the movie the day before and I thought it would be a perfect costume. I kept it a secret though because telling people what you’re going to be wouldn’t be as funny as surprising people by what you are going as. Making the costume was tougher than it sounds I had to go the Nurses department at walmart to get the shirt, a pair of shorts, I had to go to a dance studio to get a tutu (which the lady was laughingly confused on why I wanted one) I had to borrow my dads old combo boots, and use a heckload of hair gel to get my hair to stand up. It made it more fun that I actually had to make the costume not buy a single costume for 20 bucks. And the reactions for certain items I needed were the best. I had to try on the shirt to make sure it was the right size so I hope the security cameras got a good shot of me in a nurses shirt. The reactions were the best part! I had many fans of the movie ask me to do the scenes from the movie, I had people who weren’t fans just laughing for the pure fact of me wearing a tutu because I mean a dude in a tutu is never not funny. I was constantly asked to run in slow motion, and redo it in an instant replay which always made somebody chuckle. I won the funniest costume portion of the contest and it was an awesome feeling knowing I made people laugh. The best part though is when the girl had a cat, and it kept thinking the tutu was some kinda string toy and was chasing me around to attack it, so to make it even better I ran away from it in slow motion making everybody die of laughter. 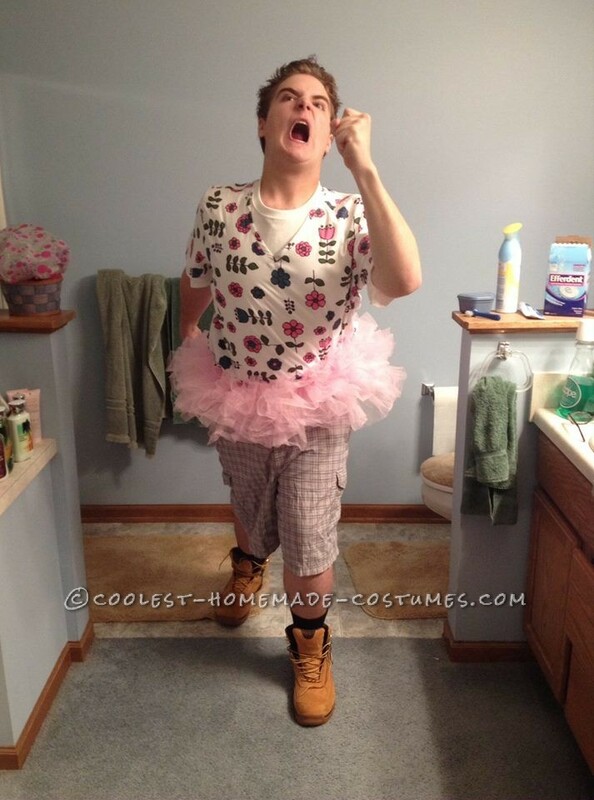 Homemade costume idea posted by Thomas S.
“Mental patient”, how disgusting and disgraceful. This is literally making fun of mental health patients with serious problems.